Genera 7, species 260, natives of the warmer parts of both hemispheres. The grape fruit is the only important production of this order. The acid of the grape is tartaric. It contains a sugar which differs from the common sugar in containing a smaller quantity of carbon. 687 Flower of V. Labrusca. 1. 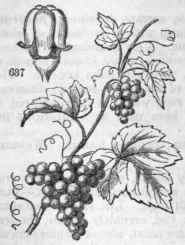 VITIS, L. Grape Vines. (Celtic gwyd, a tree or shrub.) Petals deciduous, cohering at the top, or distinct and spreading; ovary partly enclosed within the torus, 2-celled, cells 2-ovuled; stigma sessile, capitate; berry 1-celled, 1 to 4-seeded. Ped. often changed into tendrils. § Petals cohering at top and falling without expanding. § Petals free at top, finally expanding and falling. 2 V. aestivalis L. Lvs. broadly cordate, 3 to 5-bbed or palmate-sinuate, coarsely aentate, with scattered ferruginous hairs beneath; fertile rac. long, panicled, berries small. - Grows in woods, by rivers, etc. St. very long, slender, climbing, with very large leaves, which are sometimes with deep, rounded sinuses, clothed beneath, when young, with arachnoid, rust-colored pubescence. Tendrils from the peduncles which are dense flowered, and with a leaf opposite. Petals cohering at summit. Berries deep-blue, well flavored, but small, ripe in Sept. Flowers in Jun. 4 V. vulpina L. Fox Grape. Scuppernong. Lvs. (small) cordate, slightly 3-angled or lobed, shining on both sides, coarsely toothed, the teeth not acuminate; rac. composed of many capitate umbels. - River banks Va, to Fla. Sts. many feet in length, straggling or climbing. Lvs. 2 or 3' diam., shining most on lower surface, having the sinus at base acute, and the terminal tooth rather pointed. Fr. large, pleasant, few in a cluster. The variety called "Scuppernong" is quite common in southern gardens. 7 V. vinifera L. European Wine Grape. Lvs. cordate, sinuately 5-lobed, glabrous; fls. all . - No plant in the vegetable kingdom possesses more interesting attributes, is cultivated with greater care, or has been worse perverted and abused, than the common vine. By cultivation it sports into endless varieties, differing in the form, color, size and flavor of the fruit, and in respect to the hardiness of its constitution. 2-seeded. - A shrubby vine. The tendrils attach themselves by an adhesive foot-like expansion at the end. A. quinquefolia Mx. Lvs. quinate, digitate; lfts. oblong, acuminate, petiolate, dentate. A vigorous climber, found wild in woods and thickets. It has long been cultivated as a covering for walls, and is best known by the name of woodbine. By means of its foot-like, adhesive tendrils, it supports itself firmly upon trees or walls, ascending to the height of fifty feet. The large quinate leaves constitute a luxuriant foliage of dark, glossy green, changing to crimson in autumn. Fls. inconspicuous, greenish, in dichotomous clusters. Berries dark-blue, smaller than peas, acid. Jl.